There are two C’s which serve as signs to signify that one’s life is complete: ‘confidence’ and ‘contentment’. Despite flaws, anyone can still live a complete life due to confidence and contentment. But after the letter C is D and before it is B. There is still a ‘desire’ to be ‘better’ amidst contentment and confidence. The same applies to beauty. Although beauty is in the eye of the beholder and one asset can actually hide another flaw, any man or woman will definitely admit to the desire to be better in terms of physical features. 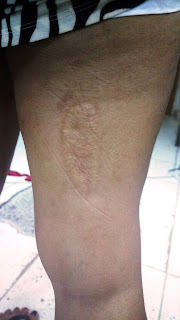 In relation to this, there’s only one thing which had bothered me for more than two decades now; it’s that scar at the back of my right hip just a little above my knee. hey, found a better option for this scar, see post on tattoos. How did I get it? I was about 6 years old when I jumped from a carabao-pulled farm cart straight towards live barb wires. This was when the old lady who owned the cart got mad with us kids playing at her property. I guess I didn’t have time to think anymore and was too scared that I leaped straight to the fate which sealed this scar on my hip. That same scar had prevented me from wearing short shorts or skirts. I’ve had to wear something that’s limited to no more than 4 inches above the knee line; otherwise, the 3 & ¼ inch long by 1 & ¼ scar will pop out. It didn’t bother me much when I was younger but it started to take its toll when I reached puberty. Contrary to the confidence and contentment I was talking about earlier, the scar contributed to my insecurity issues. Don’t get me wrong, I am confident and contented with other details of my physical features. I know that I am blessed with gifts that I am in gratitude for. Being able to express myself or for clients effectively through web content writing should be more than enough to suffice everything I lack. But then again, enter letters D and B as I’ve mentioned earlier; the desire to be better. So I tried a few options in relation to this imperfection. Most everyone knows that famous product sebo de macho. It’s a fatty substance derived from sheep and cattle. Some attests to its effectiveness, particularly when heated prior to application and applied over fresh scars or even healing wounds. But it didn’t work on me. There were several other products I’ve tried and tested over the years which are herbal, natural, and medical in nature. I can’t recall all of them but I remember the most recent one. It’s a natural product from a U.S. company called Revitol. I simply stopped without finding out whether it works or not because it was messy and I am not too diligent to apply it three times daily as recommended. The product is at least honest enough not to promise miraculous claims. Its effectiveness is dependent on a few factors including the size and age of the scar. So it follows that the larger and older the scar is, the longer you would need to use the said product. If I would consider how long I would need to use it consistently on mine, it may take a year or even longer! So I simply let it go and stopped using the product. It at least became a profitable business for an online shop though. Anyway, I was used to modest clothing ever since I was younger and have often purchased clothes which don’t reveal the decade old scar. I also always take note of the measurements above (not more than 4 inches above knee level) even for swim wear except last month over Boracay’s shores. I wore what I wanted to wear and didn’t bother being bothered by that scar because I covered myself with a shawl. I also have another option in mind. I already have 6 tattoos in my hands and feet. I intend to add at least one more at the back; make that two to cover the scar I’ve been mentioning here. It won’t technically be covered but tattooing will transform it into something more artistic. I’ve seen pictures of how this can be done all over the web. But then again, wait! I just received an invitation from Flawless over email and I have only one service in mind! I’d like to try the Fractional Needling Therapy for the reasons stated above. It’s about the two C’s, B beforehand, and D afterwards. Once again, these refer to being more confident and contented and yet still have the desire to be better. In its practical sense, I’d like to wear short shorts or skirts and swimwear without having to worry about that mark. It’s not about commanding attention for selfish reasons; it’s just to try something I’ve never gotten the chance to try before. Still it boils down to the two C’s, B and D.
What is Fractional Needling Therapy? What exactly is Fractional Needling Therapy by the way? Frac and Roll, based on what I have researched uses Flawless’ micro needling therapy through the use of tiny needles treated with medicines including BSC or biological stem cells. Many of us are familiar with this new scientific breakthrough and its medical uses, particularly for literally reviving dead cells, tissues, and organs. Supposedly, the positive effect on scars will be evident right after the first session alone. This I have to try no matter what considering the fact that a Flawless shop is actually located in a nearby city mall close to my hometown here in the province. In celebration of its 11th birthday, Flawless is inviting everyone to take advantage of its 1 + 1 beauty blowout this National Flawless Month. If this isn’t the best time to boost or jumpstart your top to toe beauty transformation, then I don’t know what is. Go to www.flawless.com.ph or visit a clinic near you for more information.